One of our favorite things to do as a family during the holiday season is watch Christmas movies together. It’s so fun to introduce the kids to old favorites from our childhood and also to find new titles to add to our list. I keep our Christmas movies with our decorations so that they’re only pulled out to enjoy during this time of year to make it more special. 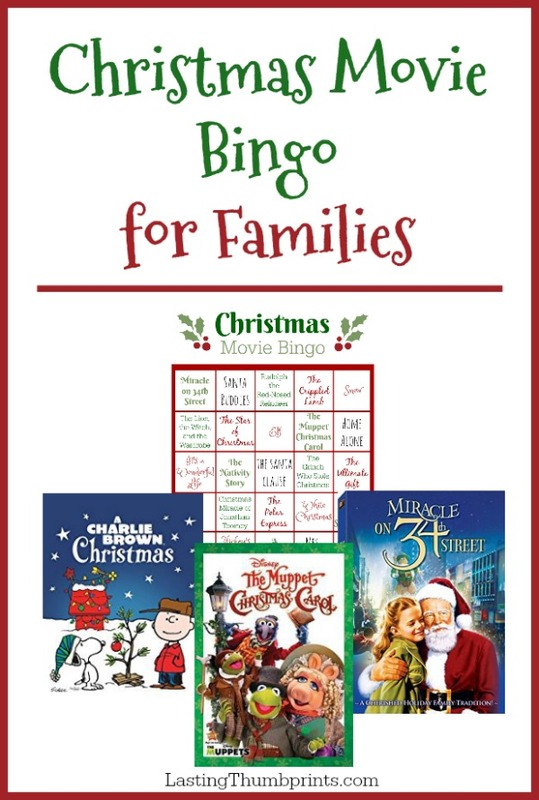 To add a little extra fun to our movie nights I created this Christmas Movie Bingo Printable to keep track of what we watch. I think it may even help settle a dispute or two over what we should watch next. And great news! I’m offering the free printable to my subscribers because I think they rock! I’ve picked 25 of our family’s best-loved Christmas movies. Some of these movies our younger children aren’t allowed to watch yet. I’ve included links below to each movie so you can easily identify which ones they are and to also help you decide if a movie is a good fit for your family. If you are looking for reviews of the movies to help your make your decision, my favorite review site is Kids-in-Mind. Subscribe in the box below to receive your free copy of the Christmas Movie BINGO printable and other exclusive freebies and content from Lasting Thumbprints! Does your family have a favorite Christmas movie? Leave it in the comments below! can I ask where you found all of the movies to download?? ?